Capillary Blood Collection | Tamar Laboratory Supplies LTD. The preassembled end-to-end capillary ensures a controlled collection to the capillary technique. 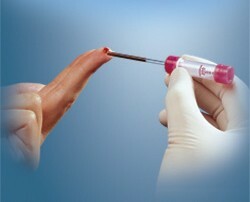 The Microvette® enables blood sampling using either the special rim or the gravity-flow principle without any problem. Depending on individual requirements, the Microvette® is available with a cylindrical inner tube for optimum mixing results or a conical inner tube for a high serum/plasma supernatant. The cylindrical outer container is ideal for barcodes and patient labels. The special cap design minimizes aerosol effect when the tube is opened and provides safe sealing features.